Tom Harkin is the junior Democratic senator from Iowa. These remarks appeared in the May 21 edition of the Congressional Record. E.B. 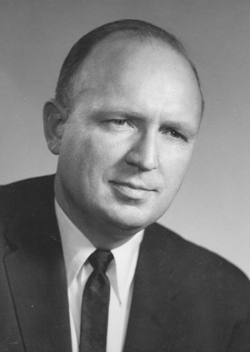 Smith in the 1960s. Madam President, with the recent death of Dr. Elbert B. Smith -- known to his friends simply as "E.B." -- I lost a much beloved mentor, advisor, and friend. Obituaries in the Washington Post and elsewhere have captured the essential facts of his life. Since 1990, he was professor emeritus at the University of Maryland. He served in the Navy in World War II, earned his master's degree and PhD at the University of Chicago, and taught at Iowa State University, among other colleges, before joining the faculty at Maryland in 1968. Over the years, he also served as a Fulbright professor at the University of Tokyo and at Moscow State University, and elsewhere. He ran unsuccessfully for the U.S. Senate as a Democrat in Iowa in 1962 and again in 1966. What those factual obituaries fail to capture is the spirit of this remarkable man -- his personal warmth, his talent for friendship, his great love of history and scholarship, and his passion for progressive causes. He was one of the most influential people in my life, beginning in my years as an undergraduate at Iowa State University, where he was a history professor. He inspired me to get involved in politics and public service. When he ran for the U.S. Senate in 1962, I got involved in his campaign. And what a campaign it was -- an unconventional, insurgent, student-run campaign against the status quo. This was six years before Senator Eugene McCarthy ran a similar campaign for president. While working on his campaign, I was also president of Young Democrats at Iowa State, and we had just passed a resolution urging the admission of Communist China to the United Nations. Of course, this could have been an embarrassment to the Smith campaign. But to his great credit, E.B. said: "That is your call, Tom, stick to your guns, I'll stand by you.'' That is the kind of principled person he was. During the campaign, E.B. went to Washington to have his endorsement photograph taken with President Kennedy. There is a picture of E.B. presenting JFK with a copy of his scholarly biography of Senator Thomas Hart Benton, titled Magnificent Missourian.' The reason E.B. chose this gift, of course, was that Thomas Hart Benton was one of the eight senators that Kennedy included in his book Profiles in Courage. E.B. lost that 1962 election, but only very narrowly, against the longtime incumbent Senator Bourke B. Hickenlooper. But that campaign was revealing of the kind of man he was: a straight-shooter, a person of great integrity, serious but with a sense of humor, a fighter for the little guy, standing up for civil rights and economic justice. Fast forward a decade. In 1972, I was fresh out of law school. Ruth and I moved back to Ames, and, frankly, we were flat broke. E.B. allowed us to live rent free in a house that he owned in Ames. With that house as campaign headquarters, I ran for Congress again in 1972, with a student-run, insurgent campaign modeled after E.B. 's 1962 effort. I lost, but we did well enough to run again in 1974, and win. When I arrived in Washington in late 1974 as a newly elected Representative, E.B. and his wife Jean were living in College Park, where he was teaching at the University of Maryland. My wife Ruth was serving then as Story County attorney, and had to stay back in Iowa. The Smiths generously allowed me to live with them for the next three years. I commuted back to Iowa on weekends. From his days in the Navy, E.B. loved to sail and was an expert sailor. Many a time he took me out on the Chesapeake Bay on his boat. I always felt that he liked it best when the weather was cold and foul, with the rain pouring down. The rest of us would be huddled down below, and E.B. would be up top, steering the boat, having a great time. It reminded him fondly of his days as a Navy deck officer in the Atlantic during the war. Over the decades during my time here in Washington, one of my great joys has been my sailing outings with E.B. Of course, the other great joy of E.B. 's life was Jean, his wife of fifty-eight years, their five children, nine grandchildren, and eight great-grandchildren. After Jean died in 2002, E.B. found another wonderful partner -- coincidentally, also named Jean -- who filled his last years with much happiness. E.B. Smith was a dear friend and an invaluable mentor. He imbued me with the ideal that politics and public service are honorable callings. He always said to me: Don't worry about losing, do what is right, stick up for your principles. I feel truly blessed to have had the friendship and counsel of E.B. Smith for so many years. He touched not only my life, but the lives of so many others all across the globe. He died one day short of his ninety-third birthday, after a full, active, and accomplished life. Through his scholarship, generosity, and simple human decency, he made the world a better place.